The Deputy Chief of Defence Staff of the Malian Armed Forces, Brigadier General Didier Dacko has eulogised the Nigerian Armed Forces for their exceptional role in peace keeping and high professional conduct in all military operations in the sub-region, Africa and around the globe. 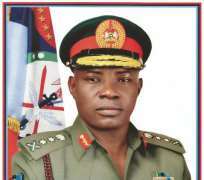 Brigadier General Dacko made the commendation when he visited the Chief of Defence Staff (CDS) General Abayomi Gabriel Olonisakin at the Defence Headquarters, Abuja. While praising the Nigerian Armed Forces for its leadership role in the West African sub-region, he stated that he was in DHQ to understudy the Nigerian Armed Forces winning strategy against the dreaded Boko Haram Terrorists so that his country can replicate same in tackling the security challenges in Mali. In his remarks, the CDS restated the Nigerian Armed Forces readiness to partner with any country in the sub-region to curb the menace of terrorists and reactionary forces. He urged the regional security forces to evolve new strategies in intelligence gathering and sharing to unmask and defeat terrorist elements working against the progress of the continent. General Olonisakin noted that the regional security forces must synergise to tackle the common enemy who are hell bent to destabilise the region. The CDS also expressed willingness to support the actualisation of an operational African Standby Force. He therefore called the regional forces to close ranks and bridge the gap to achieve the vision of having a terrorists free region.